This box works great as storage for tarot decks. Size is 5 inches by 8 inches. Made of cast resin, with a hinged lid and soft velvet inside. 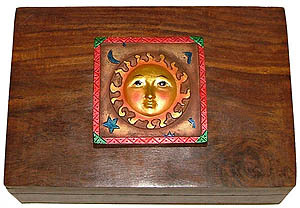 Embossed Sun Wooden Box Wooden box with a 3D Sun shape on top. Works great as storage for tarot decks. Size is 4 inches by 6 inches. Opens on hinges. 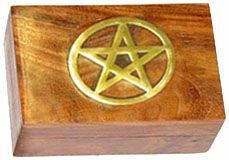 Wooden box with brass inlay in a pentagram shape. Works great as storage for tarot decks. Size is 4 inches by 6 inches. Opens on hinges. 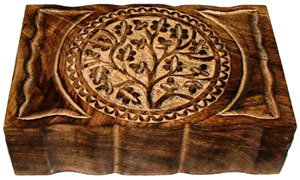 Tree of Life Wooden Box A gorgeous hand carved and polished box, with a Tree of Life design on the top. Size is 9 inches long, 6 inches wide, and 2.75 inches tall. A beautiful gift item! 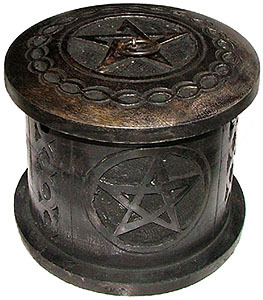 This round storage box is painted a polished black color, and carved with Pentagrams all over. The lid comes off as a separate piece. Size is 6 inches wide, and 5 inches tall. 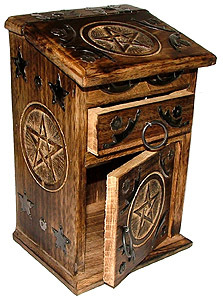 Tall Pentagram Box with drawer A stunning gift box! 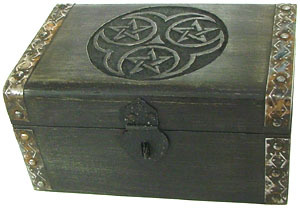 Pentagram carvings and decorative metal designs cover this box with three separate compartments. The top lid lifts up, the drawer pulls out, and the door on the bottom swings open. The wood has a glossy dark stain. Size is 9 inches tall, 5.5 inches wide, and 5 inches deep. A stunning gift box! A Pentagram carving on the top, and Triple Moon Goddess symbols on the sides! Decorative metal accents cover the front and sides, which looks great on the dark black paint. Size is 7.5 inches tall, 6.5 inches wide, and 5.5 inches deep. Small Treasure Chest Box A cute treasure chest gift box. 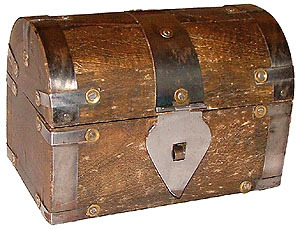 Metal and rivets decorate it on all sides, and the metal clasp in front can use a small lock. Size is 3.5 inches tall, 5.25 inches wide, and 3.5 inches deep. 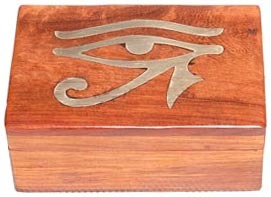 A polished wooden box with an inlaid brass pattern of an Egyptian Eye of Ra. Size is 4 inches by 6 inches, perfect for most tarot decks. 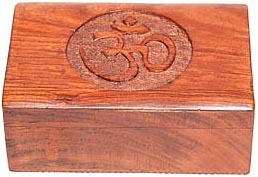 Om Symbol Carved Box A polished wooden box with a carved pattern of the sacred Hindu symbol Om. Size is 4 inches by 6 inches, perfect for most tarot decks. 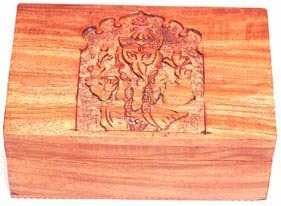 A polished wooden box with a carved pattern of the sacred Hindu god Ganesh, who is said to bring good luck. Size is 4 inches by 6 inches, perfect for most tarot decks. 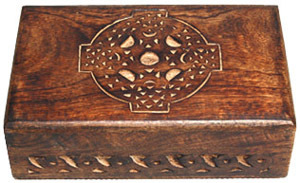 Celtic Cross Carved Box A dark polished wooden box with a carved pattern of a Celtic Cross. Size is 4 inches by 6 inches, perfect for most tarot decks. 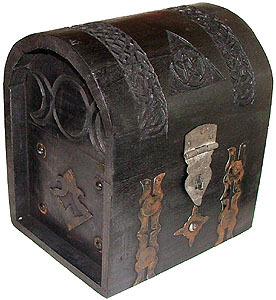 A black box with a latch in front, carved with three pentagrams on the lid. Size is 8 inches by 5 inches. 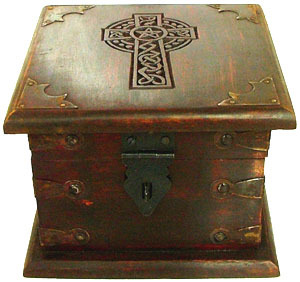 Celtic Cross Latched Box A dark reddish box with a latch in front, carved with a Celtic Cross on the lid and decorated with metal accents. Size is 6 inches by 6 inches by 4.5 inches tall. 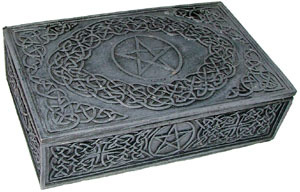 A box made out of carved and polished soapstone, with a pentagram in the top. Size is 6 inches by 4 inches, perfect for most tarot decks. 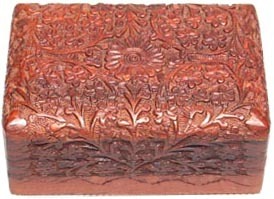 Flowers and Vines Box A box made out of wood, covered with flowers and vines carved into the top. Size is 6 inches by 4 inches, perfect for most tarot decks.